Veterans who served in all branches of the United States military were honored Saturday at the American Legion Hall, 17034 Page Ave. in Hazel Crest, IL. Local, state and federal elected officials, many of whom served in the armed forces, celebrated the military veterans in honor of Veteran’s Day. “Veteran’s Day is the day we get to celebrate the service of those who protected our freedoms overseas and here at home,” said Illinois State Sen. Mike Hastings (Dist.-19). “Our greatest asset in our country is the young men and women in our armed forces and its right that we appreciate what they do. Ill. Sen. Hastings served in the Army and earned the rank of captain in the 1st Infantry Division. He spoke of how much he values his life, recalling a fatal car bombing that claimed the lives of his fellow servicemen — a mission that he was otherwise normally assigned to. 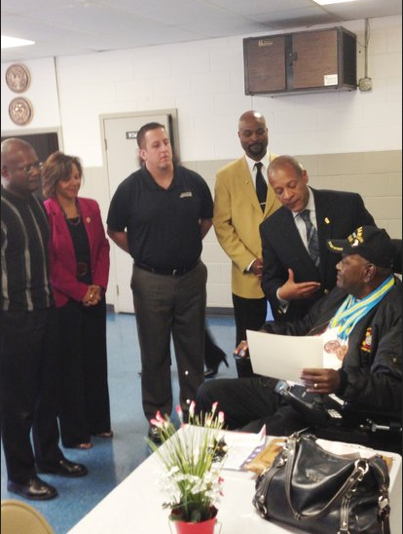 Vernard Alsberry Jr., Hazel Crest Village President and military veteran was also present during the event. Alsberry served in the United States Air Force from 1977 to 1987 as a physical therapy technician. The significance and meaning of Veteran’s Day was highlighted during the emotional ceremony. Ill. State Rep. Riley served in the Army from 1972-1978 both active and reserve as a staff sergeant and worked in the infantry, psychological operations and civil affairs. Veterans were acknowledged, too, for their personal sacrifices. Leo Moore, a Vietnam veteran, was honored in particular for his outstanding service and sacrifices. Moore, who is bound to a motorized wheelchair, is proud of his military service. U.S. Congresswoman Robin Kelly (Il. – 2nd) stated at the ceremony that she would continue fighting for veterans at home.